This funnel swirl soap recipe is remarkably easy to make and as an added bonus, it is palm free. Made from Coconut oil, Shea butter, Cocoa butter, Castor oil and Olive oils, this soap has a thick and rich lather you will love. For that little something extra, I've included white kaolin clay to the recipe so that you can use it as a shaving soap as well. The beautiful bright colours are achieved using oxides, micas and ultramarines. Since the room temperature method has become my absolute favourite method of soap making, I really wanted to make this funnel swirl soap recipe using it. I was a bit nervous about doing so since the recipe is quite high in cocoa butter and I wasn't sure if the hot lye would be enough to melt it down before the soap started to trace. To help the process along, I chopped up the butter into very small pieces...just like you would to melt chocolate. It worked beautifully. Lye - 122.5 gr. | 4.32 oz. Turquoise soap colour - 1/2 tsp. Yellow soap colour - 1/2 tsp. Green soap colour - 1/2 tsp. 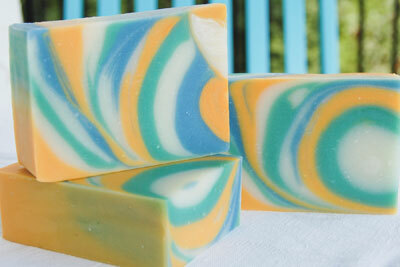 For the funnel swirl soap recipe you will want to make sure to have all of your ingredients measured before you start. Taking the time to prepare at the beginning of the soap making process makes all the difference when it comes to having a successful soaping day. You will need to prepare a brace for the funnel so that it will sit on top of the soap mould. I made mine by placing two paint stir sticks parallel to each other. I then used painters tape and cardboard (from a cereal box) to tape them together. It turned out to be very sturdy and I will be able to use it to make the funnel swirl soap recipe for quite some time. Next you will want to get the colours ready. Into each of four containers, place 1 tablespoon olive oil and 1/2 teaspoon kaolin clay. Add the white mica to one container, the turquoise colour mix to another, the yellow to the next and finally the green into the last container. This part is the bit I don't really like but if you do not spend the time on it you will get oxide lumps in your soap and it really does ruin the look. Mix the powders into the oil until each container is completely smooth and without lumps. Assemble all of your ingredients together and put away anything no longer needed. Place all of the hard oils into your soap making bowl and then mix the water and lye together. As soon as the lye water is no longer foggy and all of the lye crystals have dissolved, pour the lye solution over the hard oils. Using a whisk, gently stir the lye solution and hard oils until all of the hard oil bits have melted. This is important. ALL of the bits need to be completely gone. Now you can add in the castor oil and the olive oil. For the most part, I used my whisk to bring the soap to trace. I didn't want to risk getting the soap too thick before I added in the colours. A couple of twirls with the stick blender was all I did and it was enough. You want to bring the soap to a light trace not a thick one. Divide the soap up into the four containers. I poured more soap batter into the white and yellow than in the green and blue but you can divide it up how you like. Thoroughly mix the soap and colourants together using a small whisk and/or spatula. I haven't been adding scent to my soap due to allergies I have developed (darn family genetics finally caught up with me!) but if you are going to add scent, now is the time to do so. Once that is done you can start to pour. Alternating between the colours, pour a portion of each colour into the funnel, one at a time, until all of the soap is in the mould. Be aware that the more you alternate, the thinner the layers of colour will be. More alternating = more layers. When all of the soap is in the mould, give it a bit of a jiggle to flatten the soap out. Close up the soap mould, wrap in a blanket (if necessary) and put it to bed. Leave it overnight and cut when it is firm enough to handle. The funnel swirl soap recipe is best left to cure for about 4 weeks before using.